Black calf with the same floral brogue on the toe as Pelham. 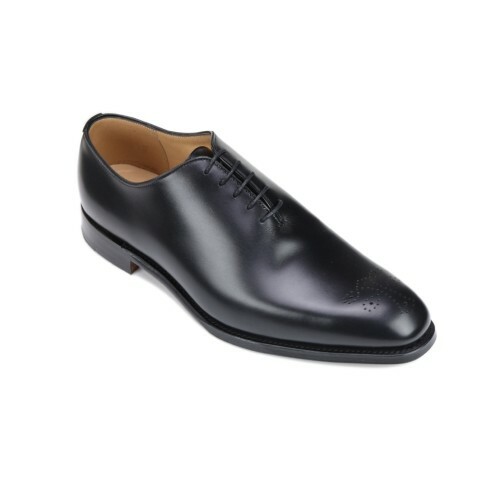 A beautifully elegant Gentleman’s shoe just as at home in the office or with a tail coat. Goodyear welted? Fully leather lined? Oak bark tanned soles? Calf leather? Made in England? Of course! The epitome of the Northampton made shoe. If you look after them there is no reason for them not to last for many, many comfortable years.These 'whole cuts' give the wearer a sophisticated bespoke look. The Wentworth is a black brogued whole cut and the last is suitable for an average to wider foot. They cost a little bit more because of the high cost of discarded leather in trying to find a large enough piece of flawless leather to make them from - as the style name implies.